Today, December 24th, we show you Angel's Trumpets that are in full blossom in the Garden. 12월24일 오늘은 원내에서 한창 잘 피고 있는 <천사의 나팔>--엔젤 트럼펫을 소개드리겠습니다. 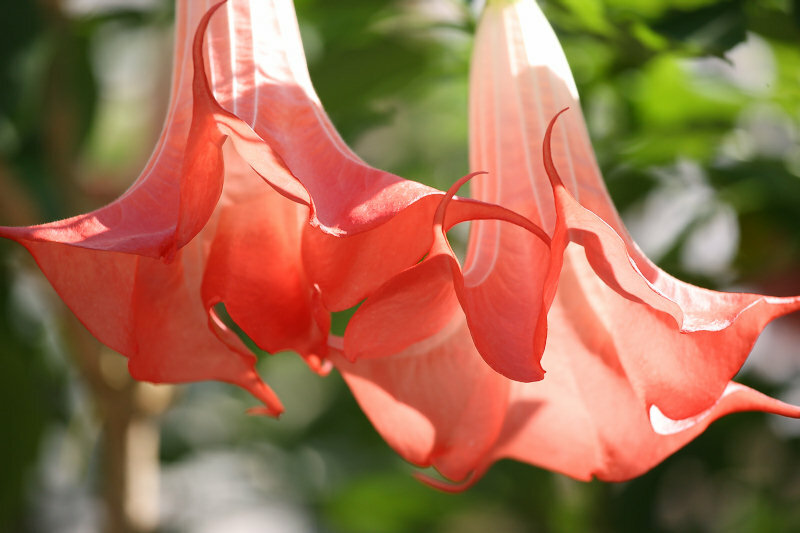 These plants are trees native to tropical American highlands, belonging to the genus Brugmansia in the Solanaceae family. 이 식물은 가지과에 속하는 원산이 열대아메리카고지인 목본식물입니다. It has been popularized in Japan from about 20 years ago. 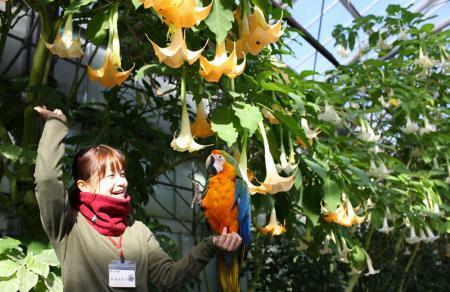 It is hardy in warm district, and you can see its flowers often during summer recently. 일본에서 보급되기 시작한 것은 약 20년전부터입니다.따스한 지방에서는 겨울을 지나기 때문에 요즘은 여름에 꽃이 피는 것이 많이 보입니다. 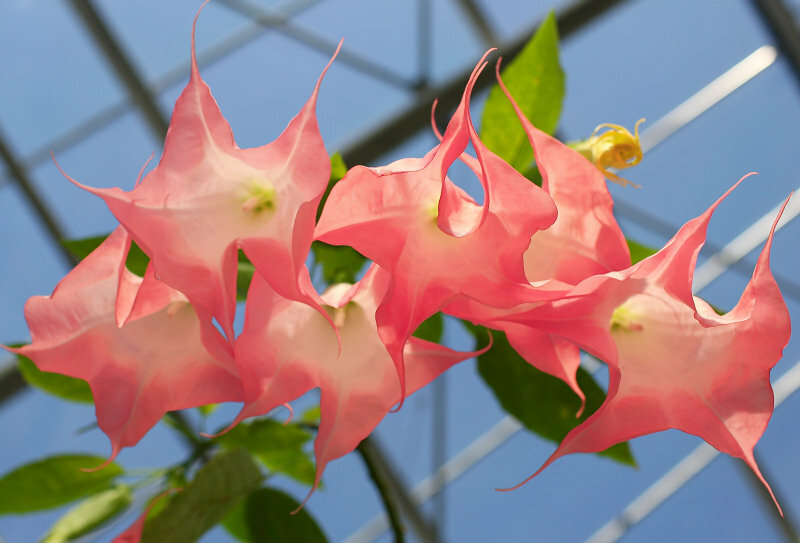 The Group focus on this plant because it is a fast grower that a cutting can grow up into a huge tree in a year or two, and it bear flowers roughly all the year round;we have to say "roughly" because it actually has periods with more flowers or fewer flowers. 당그룹에서 이 엔젤트럼펫에 착안점을 둔 것은 성장이 빠라고 삽목을 해도 1,2년정도면 예쁘게 필수 있을뿐만 아니라 일년내내 피는 특성이 있기 때문입니다.하지만 일년내내 핀다고는 하지만 파동이 있어 피는 시기와 피지 않는 시기가 있습니다. 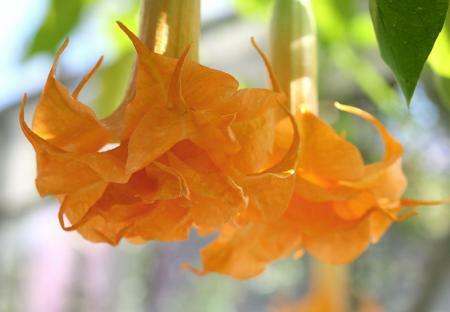 The stems of Angel's Trumpets that have grown during autumn set flowers in December. Thus, many trees of Agel's Trumpets in the Greenhouse are in blossom now. 그리고 이 12월은 겨울에 키운 줄기로부터 꽃이 피는 계절이라 온실내에 있는 대부분의 엔젤트럼펫이 한창 피고 있습니다. The flowers are white, deep pink, red orange etc.. The collection in the Garden included about 100 kinds when the Garden opened, but it seems to have reduced because many trees were killed by birds. 꽃의 색은 여러가지 있습니다.흰색,진한 핑크,빨간색,오렌지색 등.품종도 화조원이 방금 오픈했을 때는 100여종 있었는데 지금은 새들이 많이 먹어버려 품종도 많이 줄었다고 합니다. A rare double-petaled cultivar, B. cv. Herrenhäuser Gärten. The Garden exhibits original double-petaled cultivars, too. 이것은 보기드문 쌍꽃입니다.헤렌사이자 겔텐B. cv. Herrenhäuser Gärten.이라는품종입니다.당원의 오리지널쌍꽃도 있습니다. Their flowers are trumpet-shaped over 30cm long. They are beautiful looked up from below. This picture shows B. cv. Pink Favorite. 길이가 30센치를 넘는 나팔꽃모양의 꽃인데 아래에서 올려다 봐도 아주 예쁩니다. B. cv. Pink Favorite라는 품종입니다. 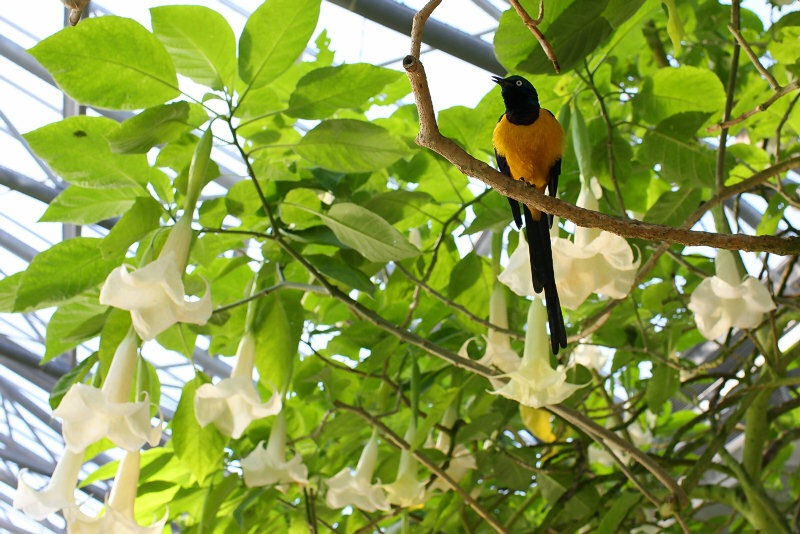 The woods of Angel's Trumpets are good place for birds to take a rest and play. I saw tropical Starlings tweeting. 엔젤트럼펫의 나무가지는 새들이 가장 좋아하는 휴식장소이자 물어뜯는 장소입니다.찌르레기도 귀여운 목소리로 재잘되고 있습니다. I asked Mr. Matsumoto with Haruka the Harlequin Macaw to let Haruka make a pause in front of Angel's Trumpets. 마침 할리퀸금강애무 하루카와 마츠모도씨가 있어서 엔젤트럼펫을 배경으로 찍었습니다.하루카쨩,하이~! 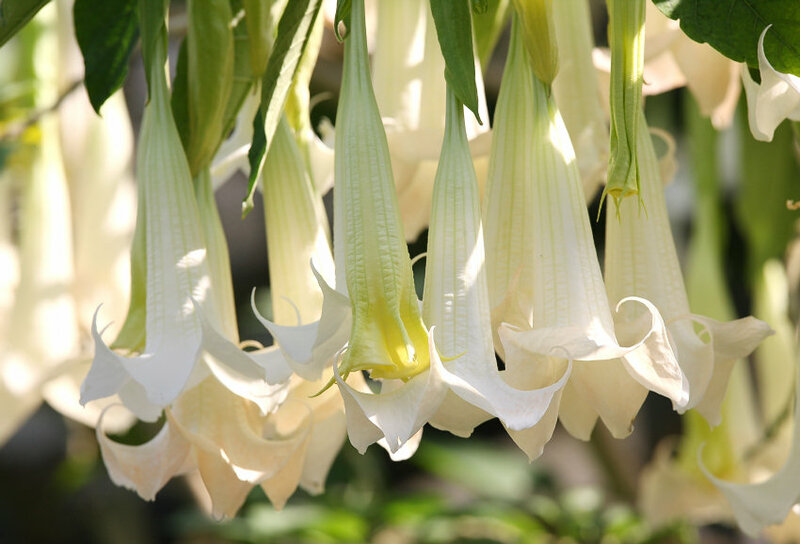 Taking a back seat in the Water Lily Pools Zone, Angel's Trumpets bear large, sweet-scented flowers. The trees look shabby because they are nibbled by Sun Conures, but their value can be recognised again. 이 엔젤트럼펫은 수련못존의 조역이지만 꽃이 아름답고 크게 필뿐만 아니라 향기도 좋습니다.최근은 쇠황금멕시코잉꼬에게 뜯기워 조금 보기싫게 되였지만 자세히 보면 아주 예쁜 꽃이라고 생각합니다.